It’s well underway, and nearly all of the ped islands are completed, and most of the striping is done as well. The only thing left is the green paint and the bike symbols. The parking hasn’t started to be enforced yet, though, but it’s sort of rideable. The first phase of the Second Avenue protected lane will stretch from 125th Street to 100th Street (Second Avenue Subway construction will delay its expansion to the south). It will eventually be paired with a First Avenue lane. Ten bus bulbs are slated to be installed on First Avenue [PDF], along with two on Second. These sidewalk extensions, like the one pictured after the jump, will help speed travel for Select Bus passengers. Pedestrians make use of an island on Second at E. 122nd Street. 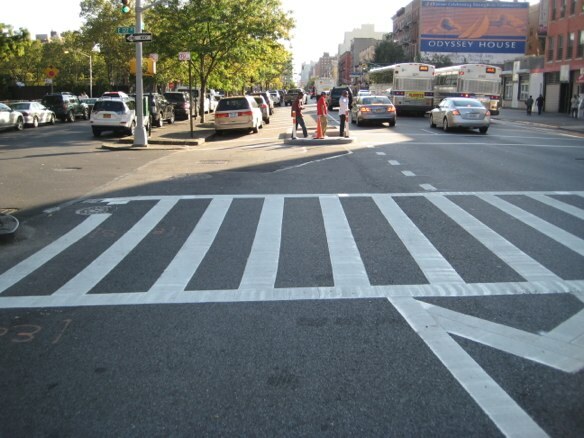 These improvements were endorsed by Community Board 11 — twice — and championed by local residents and City Council Member Melissa Mark-Viverito, who insisted on safer streets for the neighborhood despite NIMBY opposition. A bus bulb goes in on First Avenue between 116th and 117th Streets. 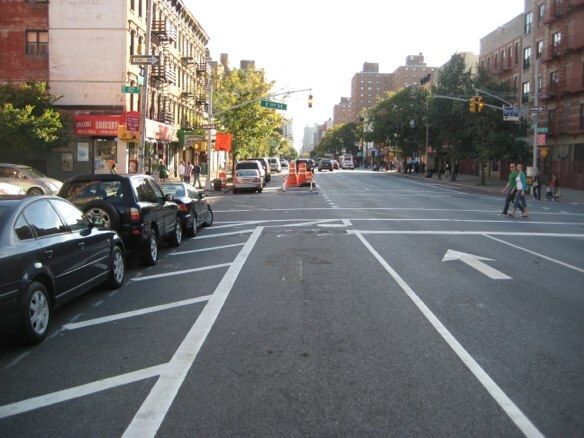 What about the protected bike lane on First Avenue from 72nd to 125th Street – does anyone know when this will be installed??? Right now it is a buffered lane (so in reality a car double parking lane). Changing it to a protected lane has already been approved by the Community Board more than once. I am worried that if it isn’t done in 2012-2013 while Bloomberg is still mayor and Sadik-Kahn is still NYC DOT commissioner, then that stretch will never get done and will remain a street re-design that is “scheduled” for implementation at some vague future date. @88b32fb69e499718d95067da9d3d7b03:disqus I don’t think anyone knows for sure, but I’d be willing to bet that it’ll be installed next spring/summer. 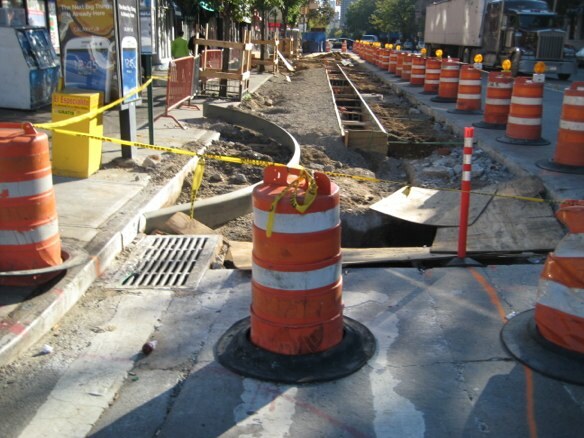 I saw crews out today repairing concrete on 1st Ave, hopefully preparing for the next phase. As far as First Ave. pedestrians, landlords, storeowners and motorists are concerned, can’t wait for Bloomberg and Sadik-Khan to go.